Like new! This saddle was used only a handful of times. Comes with everything you need to start riding right away! 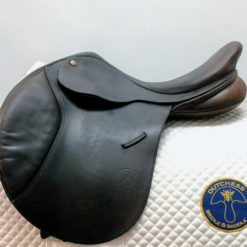 Package includes Kent & Masters 17.5″ saddle with interchangeable gullet plates, saddle cover, anatomically-shaped 50″ Camelot girth, 54″ stirrup leathers, and 4 3/4″ Centaur stainless steel stirrup irons. The Kent & Masters S-Series Compact GP is an English-style general or all-purpose saddle. It comes with an interchangeable gullet and gullet plates that you can use to fit the saddle to your horse. The saddle is compact with a narrower twist. Horse Fit Description: This saddle would fit an A-shaped wither with some hollowing behind the shoulders and a moderate to level back. This saddle has an interchangeable gullet plate system. The tree point width can be changed to accommodate a variety of wither shapes from narrow to x-wide. This saddle is currently fitted with a Medium plate. Why do we love Kent & Masters? Learn more about the design and features that make us proud to include Kent & Masters as one of our Trusted Brands!